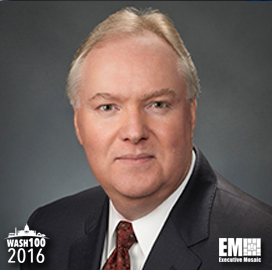 Executive Mosaic is honored to introduce Lockheed Martin (NYSE: LMT) Chief Financial Officer Bruce Tanner as an inductee into the 2016 edition of the Wash100 — Executive Mosaic’s annual selection of the most influential leaders in the government contracting arena. During 2015, Tanner helped steward two of Lockheed’s and the overall GovCon market’s most significant moves with respect to mergers and acquisitions. Lockheed announced in July 2015 the first and second steps of its reposition toward core aerospace, defense and intelligence-related work through its $9 billion purchase of helicopter manufacturer Sikorsky Aircraft from United Technologies Corp. (NYSE: UTX) and in conjunction a review of its information technology and government services businesses for separation. The IT and services businesses subject to that review are part of Lockheed’s information systems and global solutions segment, which the company projects to post nearly $5.6 billion in 2016 sales. Both actions were announced the same day as Lockheed’s second quarter earnings release with the Sikorsky buy and planned IT business segment separation as lead topics of investor questions during a subsequent conference call, where Tanner explained the ramifications of the moves to shareholders. “We are losing $6 billion worth of business on our IT tech services side which you should think of being much significantly lower (internal R&D) intensive than the rest of the business… This I think speaks to the need for that business to have as cost-efficient a structure as possible in order to survive in the environment that we are currently operating in there,” Tanner said. Six months after that original announcement, Lockheed helped announce one of the largest and most complex transactions in GovCon M&A history that will see Leidos merge into the IS&GS segments designated for separation in a Reverse Morris Trust deal valued at close to $5 billion. That January 2016 disclosure came on the same day Lockheed released its 2015 financial results — which topped Wall Street’s earnings and revenue forecasts — and Tanner again explained to investors in a call how the divestiture would affect the company’s posture going forward. “You should think Sikorsky as being roughly the same size as the realigned IS&GS. They are kind of both in the $5 billion range, if you want to put it in that perspective,” Tanner said then. Tanner became the Bethesda, Md.-based defense contractor’s CFO in September 2007 and the company has since seen its earnings per share jump 46 percent, net profit climb 12 percent and revenue rise 8 percent from 2008 results. Executive Mosaic congratulates Bruce Tanner and the Lockheed Martin team for their selection to receive this award.